CANTON, Mass. (September 22, 2014) – Dunkin’ Donuts’ famous coffee lineup has a bold new addition as of today, as the brand’s new Rainforest Alliance Certified™ Dark Roast Coffee is now available at Dunkin’ Donuts restaurants nationwide. The new Dark Roast, introduced at Dunkin’ Donuts’ new restaurants in California last month, uses a unique roasting process to bring out key characteristics of different beans, creating a bold flavor and the smooth finish without the bitterness typically associated with most dark roast coffees. 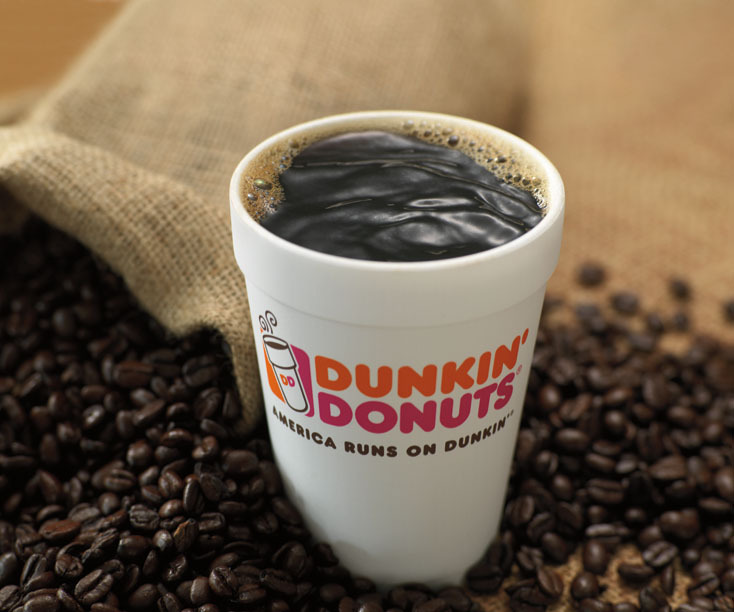 Dunkin’ Donuts guests can enjoy the new Dark Roast Coffee served either hot or iced, and it is also available for sale for brewing at home in both packaged coffee and in K-Cup® packs, for use with Keurig® Brewing systems. To help kickoff the official nationwide launch of Dunkin’ Donuts’ new Dark Roast Coffee this morning, host of E! 's "Untold" and “Live from E!” Maria Menounos, visited the Dunkin’ Donuts restaurant in Santa Monica, California. Maria, who worked at a Dunkin’ Donuts restaurant as a teenager near Boston, returned behind the counter for the ceremonial “first pour” of the new Dark Roast Coffee. Dunkin’ Donuts also today announced a special National Coffee Day offer to help America run on Dunkin’s newest, boldest brew. On September 29, National Coffee Day, guests can walk into any participating Dunkin’ Donuts restaurant across the country and receive a free medium cup of Dunkin’ Donuts hot Dark Roast Coffee, with a limit of one per guest. Then, beginning September 30 through October 5, guests can enjoy a medium cup of Dunkin’ Donuts hot Dark Roast Coffee for the special price of only 99 cents. Dunkin’ Donuts will also be making National Coffee Day a truly global celebration, with offers of free coffee on or around the holiday in most of the brand’s international markets as well. Additionally, Dunkin’ Donuts is helping guests bring the National Coffee Day celebration to home. For four days only, September 26 through September 29, all varieties of Dunkin’ Donuts’ 16-ounce packaged coffee is available for only $6.99 at participating Dunkin’ Donuts restaurants nationwide and online while supplies last. Also September 26 through 29, guests can purchase any variety of Dunkin’ Donuts K-Cup® packs at the same special price of $6.99. The offer is available at participating Dunkin’ Donuts restaurants nationwide while supplies last. Dunkin’ Donuts new Dark Roast features the Rainforest Alliance Certified seal, indicating that it is made with at least 30% coffee beans sourced from Rainforest Alliance Certified farms. The Rainforest Alliance is an international nonprofit organization that works to conserve biodiversity and ensure sustainable livelihoods. Rainforest Alliance certification helps to protect wildlife; safeguard soils and waterways; and improve quality of life for workers, their families and local communities in order to achieve true, long-term sustainability. This marks the third time Dunkin’ Donuts has introduced a Rainforest Alliance Certified product this year. In April, the brand launched Iced Green Tea featuring the Rainforest Alliance Certified seal, and earlier this month Dunkin’ Donuts introduced Rainforest Alliance Certified Colombian Packaged Coffee, the brand’s first-ever single-origin packaged coffee. Coinciding with today’s launch of its new Dark Roast Coffee, Dunkin’ Donuts has brewed a new and easy way for people to help support the brand’s efforts to eradicate children’s hunger. The Dunkin’ Donuts & Baskin-Robbins Community Foundation (DDBRCF) today launched its National Community Cups Program, in which guests are invited to make a $1 donation at Dunkin’ Donuts and Dunkin’ Donuts/Baskin-Robbins combo restaurants nationwide. In appreciation, guests will receive a paper icon, featuring the iconic Dunkin’ Donuts coffee cup, to sign and display at the restaurant. All funds raised will support The DDBRCF’s efforts to serve local communities by taking care of their basic needs: hunger, children’s health and safety. Launched in 2006, The DDBRCF has granted more than $4.6 million to local charities. The National Community Cups program will run for eight days, through September 29.